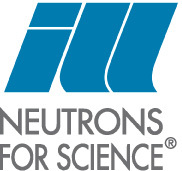 The iFit infrastructure comes with a set of dedicated procedures to read and analyze S(q,w) dynamic structure factors, aka scattering law, in the case of neutron scattering [5,6]. where N σb kf and ki are the number of scattering units, their bound scattering cross section , the final and initial neutron wave-vector, respectively. 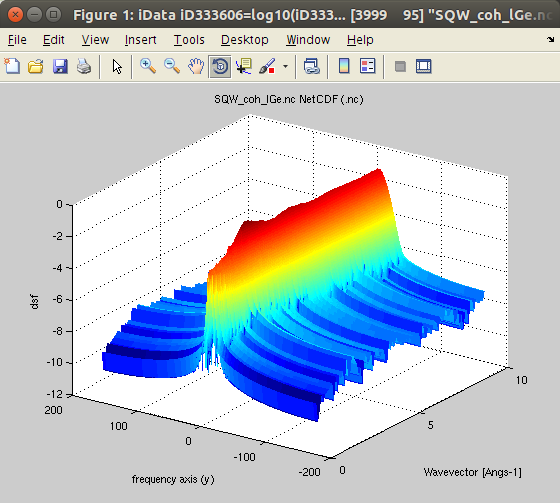 You may as well generate 4D S(q,w) models using e.g. 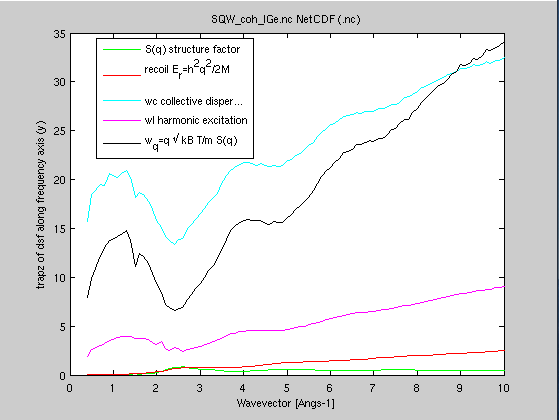 the sqw_phonons and other specialized models. Then you can compute the 2D powder average, as shown below. In this section, we describe how one can load existing data sets, or generate ones. A 2D S(|q|,w) consists in a momentum axis q (wavevector, usually in Angs-1), an energy axis w (usually in meV), and a dynamic structure factor 2D matrix S(q,w). export it into an HDF/NeXus file or as text (write_lamp, format='hdf'). Similar data sets can be measured using X-ray spectrometers. which can read HDF, text, NetCDF, and many other formats (see Loaders for a full description). 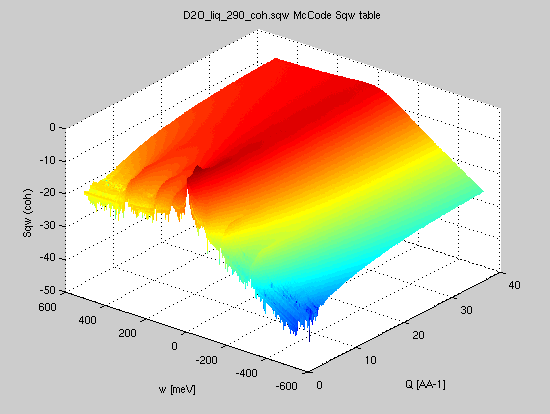 Common formats that can be read include McStas Isotropic Sqw, ISIS SPE, ILL ToF experiments, ENDF (see below). S(φ,channel) where φ is the radial scattering angle, and channel is the channel id (integer, step=1). This conversion requires to locate the experimental neutron wavelength (searched as 'lambda' or 'wavelength' in the data set), the sample to detector distance (searched as 'distance', as a scalar for radial geometry, or a vector for more complex geometries), and the time channel width (searched as 'ChannelWidth', scalar or vector). The time channel width can be given in [s] (preferred), [ms], or [us]. S(φ,t) where φ is the radial scattering angle, and t is the detection time counted from the sample location. This conversion requires to locate the experimental neutron wavelength (searched as 'lambda' or 'wavelength' in the data set), the sample to detector distance (searched as 'distance', as a scalar for radial geometry, or a vector for more complex geometries). The time can be given in [s] (preferred), [ms], or [us]. S(φ,w) where φ is the radial scattering angle and w is the energy transfer (in [meV]). This conversion requires to locate the experimental neutron wavelength (searched as 'lambda' or 'wavelength' in the data set). The conversion takes place when calling the Sqw_check routine below. The data set may extend on both negative and positive energy transfers, or only on one side. If it has only positive or negative energy values, then create the other side using the Sqw_symmetrize method, as detailed below. resize: change binning in q,w, fast rebin. reshape: change the dimensions of the Sqw data set, the number of elements must not change. meshgrid: creates a square 2D distribution, using interpolation if necessary. sqw_powder: converts a 4D S(hkl,w) data set into a 2D S(q,w) one (see below). The following procedures apply to 2D S(q,w), i.e. those that are obtained by averaging the S(q,w) over |q| in isotropic density materials. In the following, S*(q,w) is a symmetric (classical) dynamic structure factor, whereas S(q,w) denotes the non-symmetric (quantum) dynamic structure factor which contains the population factor (e.g. 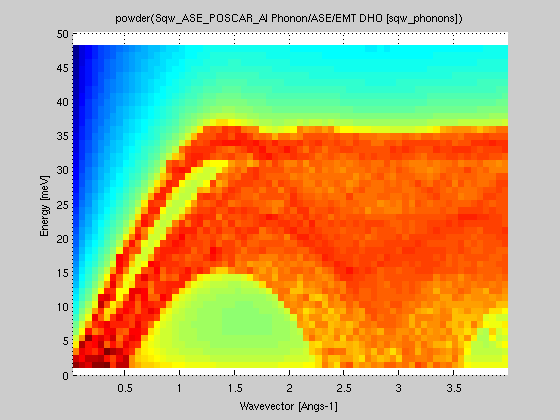 Bose for phonons). See below for more details on this. All routines below call the Sqw_check routine, which makes sure the S(q,w) data satisfies the format definition. This routine also makes, when needed, the conversion from an experimental to the S(q,w) formating. w = Ei-Ef = energy lost by the neutron in meV. q is the momentum (or wavevector) in Angs-1. All routines assume the wavevector 'q' is given in [Angs-1] and the energy is given in [meV]. Import any S(q,w) as generated by e.g. LAMP and nMoldyn/MDANSE. Extend the S*(|q|,w) in both energy sides. The initial data set should better be 'classical'. S(|q|,w) or S*(|q|,w) S(|q|,w) or S*(|q|,w) Check the S(q,w) data set. Possibly convert from experimental data S(φ,channel), S(φ,t) or S(φ,w). Compute the static structure factor. The S(q) is the same when computed from the 'classical' and the 'quantum' scattering law. Restrict the dynamic structure factor to the measurable one for an incoming energy Ei [meV]. The detection angular range can be set as 3rd argument. Compute the total thermal neutron scattering cross section which is the integral of S(q,w) over the dynamic range vs. incident neutron energy. 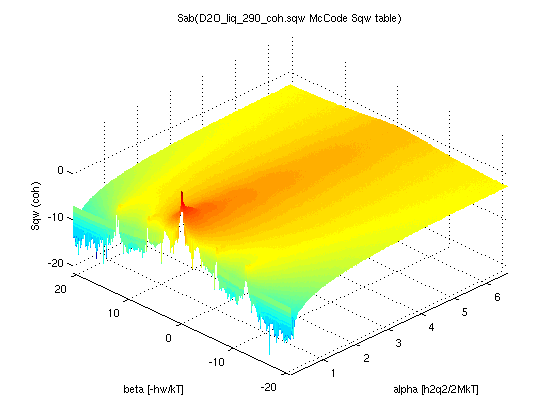 Convert a 4D S(hkl,w) model or data set into a powder averaged S(|q|,w). This can be used e.g. after calling sqw_phonons. Compute the dispersion curves and neutron intensity along the main crystal axes. Compute the energy, entropy, heat capacity, and also returns the DOS. In the following, we demonstrate the different treatment procedures, starting from an example data set obtained from a molecular dynamics simulation. Molecular Dynamics trajectories are usually computed in the NVE micro-canonical ensemble. The integrator used along the trajectory is the Verlet, which is a central difference, energy conserving integrator. As a consequence, the time evolution is symmetric (i.e. trajectories can be read in positive or negative time steps without changing the system behaviour). This implies that the derived intermediate scattering function F(q,t) is real, symmetric in time, and as a consequence S(q,w) is also real, symmetric in energy. We denote this scattering law S* to label it as symmetric. It is often named 'classical'. Then we need to symmetrize the data set, as it comes defined only in w>=0. This procedure applies to a 'classical' symmetric S*(q,w). If the scattering law you have already extends on both energy sides, you can skip this step (e.g. nMoldyn4/MDANSE). Then we can plot the symmetrized scattering law, which extends equally in both w<0 and w>0. Note: if the initial S(q,w) is already normalised so that lim S(q → Inf) = 1 , then the resulting symmetrized data set should be divided by a factor 2. The next step is to get the temperature in. This step is performed by the Sqw_Bosify procedure, which can use 3 different 'quantum corrections' to go from a classical/symmetric S*(q,w) data set to a 'real/quantum' scattering law. 'standard' or 'Frommhold' . This is the default. where hw is the energy (in meV), and k is the Boltzmann constant. Even though the 'Boltzmann' correction is the most natural correction, as it directly derives from the detailed balance, it is not recommended as it leads to a divergence of the S(q,w) for large energies e.g. above few 100 meV. The 'harmonic' correction is weaker but does not fully avoid the divergence at large energies. The 'standard' correction is probably the best when dealing with large neutron energies. In the 'classical' limit where hw << kT (and kT ~ 30 meV a 300K), all corrections are equivalent. All these corrections satisfy the detailed balance equally. So, from the symmetric 'classical' S* we can now determine the 'true' S(q,w) scattering law, at a given temperature, using the 'standard' quantum correction. When not given, the temperature will be searched in the Sqw data set. A 3rd argument allows to specify the quantum correction to apply ('standard' is default). Of course, in this example, for such a high temperature, the up- and down-scattering are about the same (the quantum correction remains close to 1). For materials at low temperatures, the two sides are highly disymmetric. The Sqw_deBosify procedure performs the opposite operation, that is compute a symmetric S*(q,w) from e.g. a 'quantum' experimental S(q,w). It corresponds with Sqw_Bosify(Sqw, -T). We can determine the dynamic range accessible to neutrons with a given incident energy, say Ei=25 meV. The integrated scattering cross section is the integral of the dynamic range, for a given incident neutron energy (see below). The structure factor S(q) is the integral of S(q,w) over the energy. We use the usual 'trapz' integrator, or Sqw_Sq which does the same. We then recommend to plot the structure factor, and possibly adapt the S(q,w) value so that the high wavevector S(q) limit should tend to 1. This is simply accomplished by dividing the dynamic structure factor S(q,w) by the structure factor limit S(q → Inf). It is here possible to compare the structure factor as measured with Ei=25 meV (i.e. restricted to the corresponding dynamic range) to the ideal one. The ratio is called the "inelasticity correction". 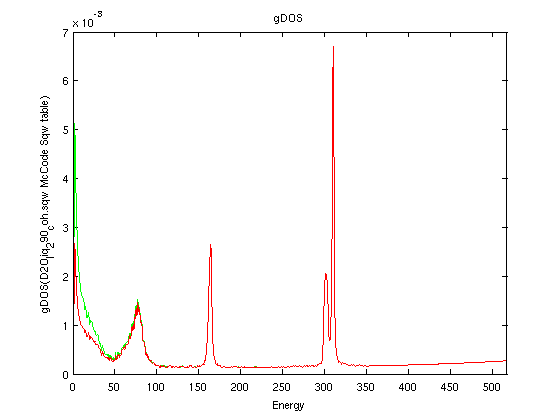 From the dynamic structure factor, one can compute the energy moments, which provide some of the characteristic frequencies [5,6,10], specifying the molar weight m of the scattering units (here 72.64 g/mol for Ge). The moments can equally be computed from a 'classical' symmetric S*(q,w) and a 'quantum' experimental S(q,w). The scattering law, from its definition [5,6], is a correlation function of the density operator, which itself depends on the position of the particles. The vibrational density of states is defined as the velocity auto-correlation function (VACF) of the particles. It is not a function of the positions. So, in principle, it is NOT possible to compute the vibrational density of states from the scattering law. From an experimental S(q,w) data set, the g(w) is obtained from the intensity in the low angle detector bank vs. the energy transfer. As such, it should only be considered as an approximation of the vibrational density of states, especially for most materials which have coherent scattering. The hydrogenated materials and e.g Vanadium are good examples of materials which are mostly incoherent, and the approximation is then good. For other materials, great care should be taken. We import the heavy water NAMD simulation (3900 molecules, 290K) coherent dynamic structure factor from here . Then we can compute the generalised density of states with the Sqw_phonon_dos procedure, from both the raw, and the symmetrized, 'Bosified' (with quantum correction) data set. When a 4D S(q,w) model is created, using e.g. 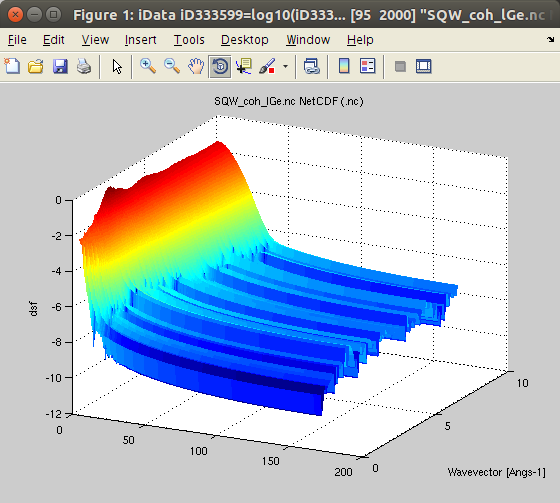 the sqw_phonons and other specialized models, one can compute the 2D powder average, which is the projection of the 4D data set onto the (|q|,w). space. The the average is obtained using e.g. 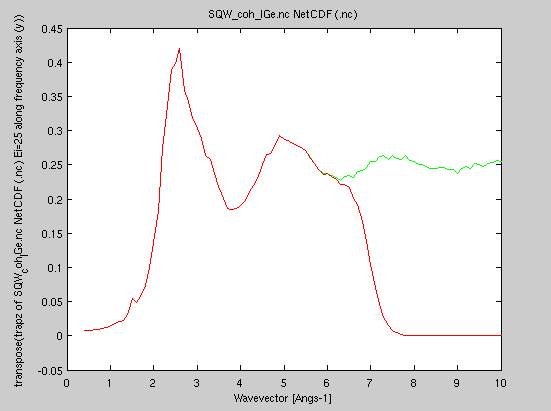 Here we have generated a 4D data set from the sqw_phonons iFunc Model, and then reduced it to 2D. The same procedure can be applied on an evaluated iData object out of the model. The symmetrization step is not needed if you import experimental S(q,w) as measured on inelastic neutron scattering spectrometers such as IN5@ILL. This type of data set already 'contains' the Bose factor accounting for the population of modes. Then the sequence of operations is first to load the data set, then apply the Sqw_deBosify procedure, specifying the temperature if it is not defined in the data set. Then Sqw_symmetrize can be applied to derive a symmetric data set which extends in both w>0and w<0. The data close to the elastic w=0 line, which can be measured in up- and down- scattering, is computed as the mean of both sides. Then, the rest of the data treatment is the same as above. P. Schofield. Phys. Rev. Lett., 4, 239 (1960). J. S. Bader and B. J. Berne. J. Chem. Phys., 100, 8359 (1994) ; see also T. D. Hone and G. A. Voth. J. Chem. Phys., 121, 6412 (2004). L. Frommhold. Collision-induced absorption in gases, 1 st ed., Cambridge Monographs on Atomic, Molecular, and Chemical Physics, Vol. 2, Cambridge Univ. Press: London (1993). B. Hehr, http://www.lib.ncsu.edu/resolver/1840.16/7422 PhD manuscript (2010). J-P.Hansen and I.R.McDonald, Theory of simple liquids Academic Press New York 2006. NIST Neutron scattering lengths and cross sections <https://www.ncnr.nist.gov/resources/n-lengths/>; See also Sears, Neut. News 3 (1992) 26.
iFit can read ENDF Thermal Scattering data sections (MF=7 MT=2 and 4), as well as ACE files (requires PyNE 0.5). The resulting data sets are S(alpha,beta) for each temperature. The general information section (MF1/MT451) is stored in all S(alpha,beta) data sets. We recommend to make use of PyNE in order to read ENDF and ACE files. where σb is the tabulated bound neutron cross section [Sears, Neutron News 3 (1992) 26] for thermal energies. The integral can be computed with the Sqw_scatt_xs procedure, for a given energy range, which should then be multiplied by the bound thermal scattering cross section σb. 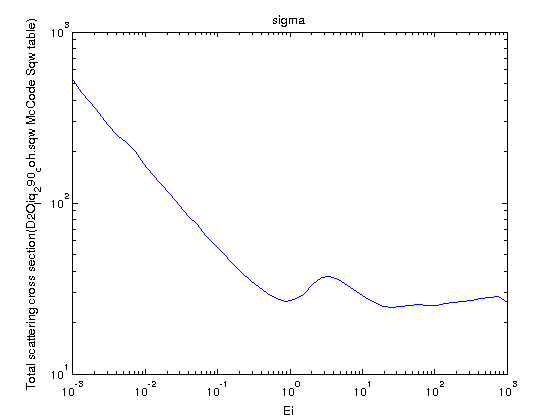 Ei = logspace(-3,3,50);% from Ei=10-3 to 102 meV. This correction is applied below the 1eV threshold, and is kept constant above it. Warning: this factor is NOT the Debye-Waller factor exp(-<u2>Q2) ! where the sums are done for each atom of mass A in the material. M = r/(1-r) = 1.06 i.e. scattering is mostly the hydrogen one. M = r/(1-r) =2.79 i.e. scattering is mostly from deuterium, but with an oxygen contribution. A dynamic structure factor as seen above can be expressed in the (q,w) space, and then the dynamical features are not highly sensitive to the temperature, except close to phase transitions. However, for historical reasons, most neutron transport codes such as MCNP, use so-called symmetric S*(α,β) which are stored in section MF=7 of e.g. ENDF and related neutron data bases. These data sets are highly sensitive to the temperature, as the axes alpha and beta are. The S*(α,β) may then be exported to e.g. ENDF and ACE files. A scaling factor may be needed, depending on how the S(q,w) data set is normalised. It is usual, in the neutron cross section data bases, to compare an evaluated double differential cross section (measured intensity) at a given angle, with an actual measurement. This procedure is trivial once the S(q,w) has been obtained, by applying the Sqw_dynamic_range procedure for the selected angle. 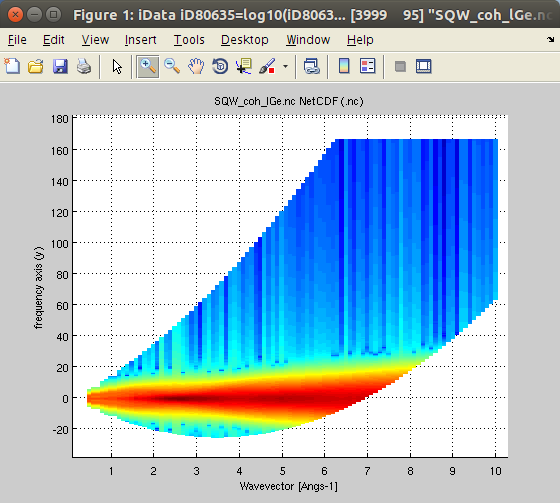 A scaling factor may be needed, depending on how the S(q,w) data set is normalised. In the following example, we use Molecular Dynamics data, symmetrize it, then apply the detailed balance to go from the 'classical' to the 'quantum' S(q,w). 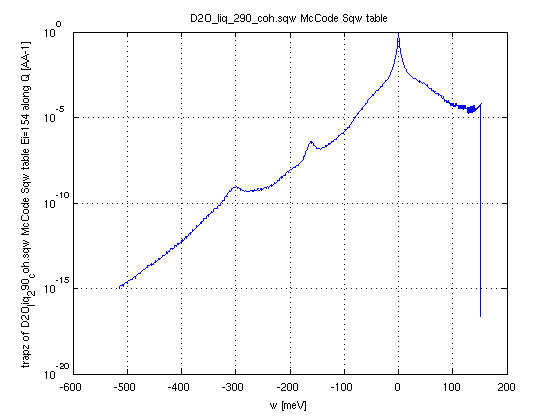 Finally, we extract the S(q,w) for a given incident energy Ei=154 meV and around 10 deg detector angle. And we plot the integral along momentum (axis 1) to show a spectrum. The energy axis must then be reversed and the incident energy be added, here 154 meV, to cope with the definition of the energy transfer used in nuclear engineering. F.G. Bischoff et al., “Low Energy Neutron Inelastic Scattering”, RPI-328-87 (1967). Provides light water data Ei=154, 231, 631 meV at θ=60 deg. E. Liu (RPI) <http://homepages.rpi.edu/~danony/Papers/RND2011/ND_Sym_Liu_4_27_11.pdf> presents light water data at Ei=600 and Ei=154 meV, and compares to older data from Bischoff and Esch. J. I. Márquez Damian et al, Annals of Nuclear Energy 65 (2014) 280–289. [link] Gathers most of this data.